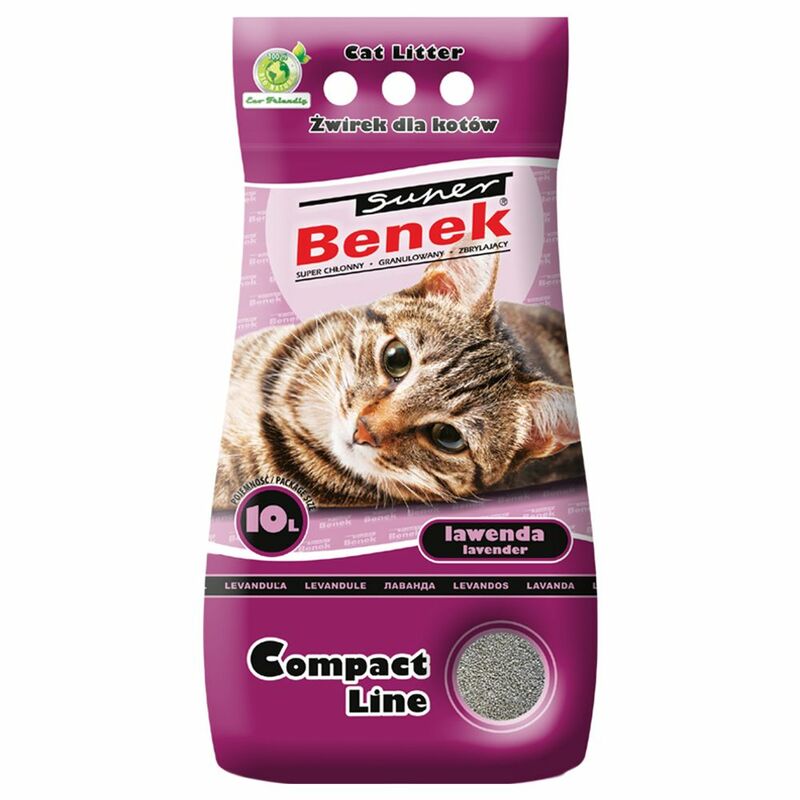 Super Benek Compact - Lavender is an efficient clumping litter made exclusively from 100% natural, top-quality bentonite. Consistent fine grains with a diameter of 0.5-2mm ensure a high yield. It very effectively absorbs both fluids and odours and ensures powerful anti-bacterial protection. Its excellent moisture retention allows the formation of primarily compact, flat clumps that don't stick to the bottom of the litter box. Super Benek Compact has a pleasant, fine consistency and is dust-free. A delicate scent of lavender ensures a pleasant atmosphere in your home. Super Benek Compact Lavender Cat Litter at a glance: Clumping bentonite cat litter Fine grain 0-5 – 2mm: high yield and soft on the paws Anti-bacterial: thanks to high fluid and odour absorption Lavender scented: for a pleasant atmosphere around the litter box Immediately absorbs odours: unpleasant odours are immediately sealed in Excellent moisture retention: quickly absorbs fluids and forms thin, flat clumps with low volume Dust-free How to use Super Benek Compact Cat Litter: Evenly distribute a 3-5cm litter layer on the floor of the litter box. Regularly remove the clumps and replace with fresh litter. Do not pour used litter back into the box after it has been thoroughly cleaned.